In addition to having all the features our reader mentioned, these specimens also have segmented bodies. 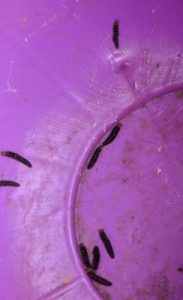 We don’t think these are worms, we believe they are soldier beetle larvae. Among worm-like organisms, soldier beetles and their larvae have shining reputations. Unlike common garden pests, adult soldier beetles don’t eat plant leaves and therefore don’t damage plants. In fact, they actually eat pests such as caterpillars and aphids, which helps protect plants. And they do more than just that… In addition to garden pests, soldier beetles feed a little on pollen and nectar, so they also help to pollinate garden flowers! 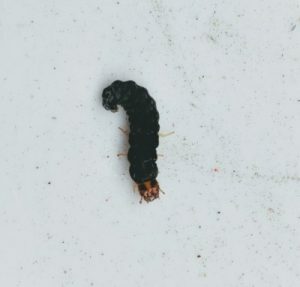 Finally, soldier beetle larvae feed on the eggs of caterpillars and other garden pests that live underground! 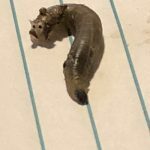 While we are confident about the identification of the creatures on our reader’s porch, we aren’t sure what exactly they are doing there. 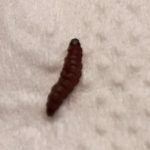 We do know that the larvae sometimes end up inside homes during the fall, but the reasons behind this are still unclear since they aren’t household pests. The best way to keep them out is to caulk or repair all cracks and to sweep out any that do crawl in. 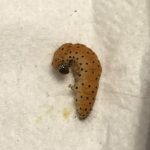 We wish our reader the best of luck while dealing with these beetle larvae and encourage her to remember that they are actually doing a lot to help her yard and garden! We wish our reader the best of luck while dealing with these soldier beetle larvae and encourage her to remember that they are actually doing a lot to help her yard and garden! 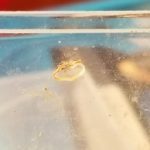 Are Mysterious Larvae Southwestern Corn Borers?